19. Beyond the Reformation in 2017? Is the Reformation over? is the title of a much discussed book by Mark Noll and Carolyn Nystrom that was published in 2005. The answer of the book was not “yes” or “no” but a sort of yes and no at the same time. According to the authors, Evangelicals and Roman Catholics can agree on two-thirds of the Catechism of the Catholic Church, and their growing cooperation is a sign that relationships are not as polemical and bad as they used to be. Therefore their long-standing separation is no longer tenable. The answer is therefore open and the book witnesses a state of flux as far as the North American context is concerned. Is the Reformation over? is also a question that will be on the Vatican agenda, especially the Pontifical Council for Promoting Christian Unity, in the next few years. 2017 will mark the 500th anniversary of Luther’s posting of his 95 thesis on indulgences. Conventionally, 1517 is considered the official and public beginning of the Reformation. That event gave rise to the controversy with Rome that eventually caused Luther to be excommunicated by pope Leo X. Attaining a “shared memory” of what happened prior to the Reformation and after it, thus appreciating the common heritage of the first millennia and a half of Christian “unity” (at least in the West) and reconciling the conflicting narratives of 1517 and beyond. Reaching an “admission of guilt” from both sides for the respective mistakes and sins. The Vatican stresses the fact that John Paul II already asked forgiveness for Catholic responsibilities in the division of the Church. Re-launching the ecumenical initiative that, after the 1999 Joint Declaration on Justification, has been losing momentum. As a matter of fact the Declaration did not have any significant impact on the ecumenical process and the Vatican is looking for another symbolic event to foster its ecumenical agenda. The imminent visit of Benedict XVI to his native Germany (22-25 September 2011) will be the opportunity to raise expectations about the 2017 events and the related joint-statement. The Pope will visit the city of Erfurt where Luther studied philosophy between 1501 and 1505 and will meet there the representatives of the German Evangelical Church. All three goals of the joint-statement are positive in themselves. Yet they raise some questions because they run the risk of becoming absolute. There is much sentimentalism about the Church being undivided before the Reformation. Prior to the Reformation unity was as broken as it would become after it. The sober reality is that the apparent institutional unity was not and is not the guarantee of unity we find in the Gospel. The “shared memory” and “undivided past” need to be less mystical and more realistic, not only as far as history is concerned but also as far as the present and future of the Church are concerned. Openness to confess one’s own guilt is always a Christian attitude to be encouraged. Protestants have many sins to confess. Yet does it mean that questioning the authorities of the established church is always a sin? Is breaking ties with a pagan system a sin? Is using “open” language to denounce idolatry always a sin? Is proclaiming “here I stand” for the Gospel whatever the cost a sin? The danger is blurring the lines to the point of being unable to distinguish between the gospel and false gospels and to come to the point of saying: all are guilty, all are forgiven! The Joint Declaration on Justification has been a failure in many respects. On the one part, the Roman Catholic Church did not give the document any ecclesiological significance. It remained a ‘dogmatic’ statement without practical consequences. On the other, for some liberal Lutherans the Gospel is determined more by inclusiveness than justification by faith. For them the document did not really reflect the heart of the Gospel. Sooner or later inflated words deflate if they are not real. In themselves documents do not foster or hinder the ecumenical process. Will this also be the case for the proposed joint-statement on the Reformation? – if and when Luther’s basic witness to the Gospel will be the witness of the world-wide Church. Till then, the Reformation is not over but continues to be an important agenda for the Church. See my review of the book as appendix of this “Vatican file”. One of the last articles that discusses the book is by Scott M. Manetsch, “Is the Reformation Over? John Calvin, Roman Catholicism, and Contemporary Ecumenical Conversations”, Themelios 36/2 (2011). This review was published on Themelios 32/1 (2006) pp. 103-104. Roman Catholicism is a pressing issue on the agenda of contemporary Evangelical theology. A lot of things are happening in the relationship between Evangelicals and Catholics worldwide and many observers are perplexed and feel the need to reflect theologically on the changing scenario. This book comes mainly from a North-American context and traces the stunning developments that have taken place from the widespread anti-Catholic attitude of many Evangelicals until the Sixties and the growing convergence reflected in many bilateral dialogues between the Roman Church and different Protestant bodies from the late Sixties onward. The North-American Evangelicals and Catholics Together initiative is just one of the instances of this historical shift. In light of the current situation, the authors ask themselves whether the Reformation is over and whether a new season of ecumenical rapprochement can be envisioned. The strength of the book lies in the informative sketch it portrays. As for its theological significance, I have two main reservations. 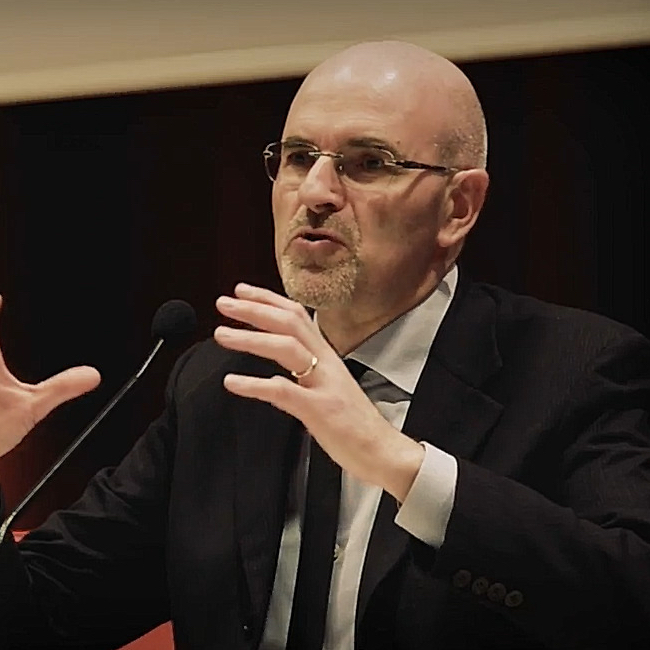 First, while it surveys many similar initiatives, it does not discuss the only ongoing official dialogue between the Vatican and a self-defined Evangelical body like the World Evangelical Alliance (previously World Evangelical Fellowship). This dialogue was prepared in1988 and started in 1993, the proceedings of its first meetings have all been published and one wonders how a historian of the calibre of Mark Noll has overlooked it. Therefore, the picture offered in the book is not comprehensive enough because, while it suggests an “Evangelical assessment of contemporary Roman Catholicism”, it does not deal with a significant source of Evangelical theological engagement with Rome. The second reservation has more to do with the theological analysis exemplified in the book. The authors recognise that they have produced “an impressionistic and rhetorical assessment” (229) waiting for an in-depth research. Their approach, however, reflects some weaknesses which can be found elsewhere in Evangelical writings on Roman Catholicism. In a useful chapter which highlights the contents of the 1994 Catechism of the Catholic Church, the authors argue that “evangelicals can embrace at least two-thirds” of it (119), that is what stems from “common orthodoxy” based on the ancient Trinitarian and Christological creeds. Later, they admit that when the Catechism speaks of Christ, it interweaves Him to the Church to the point of making them one (147; 149), which is unacceptable for Evangelicals who consider the exaltation of a created reality an instance of idolatry. So, on the one hand, there is an apparent “common orthodoxy”; on the other, there is a profound difference on the meaning of its basic words (e.g. Christ, the church, etc.). The question to raise is how can it be said that Evangelicals can accept “two-thirds” of the Catechism if this document speaks of the (Roman Catholic) Church whenever it speaks of Christ, the Spirit and, by extension, the Trinity? Are we sure that the real difference between Evangelicals and Catholics lies in ecclesiology given that the Roman Catholic view of the church is argued for in Christological and Pneumatological terms? In dealing with Roman Catholicism, especially in times of mounting ecumenical pressure, Evangelical theology should attempt to go beyond the surface of theological statements and attempt to get a grip on the internal framework of reference of Roman Catholic theology. From there we should try to assess it from an Evangelical perspective. 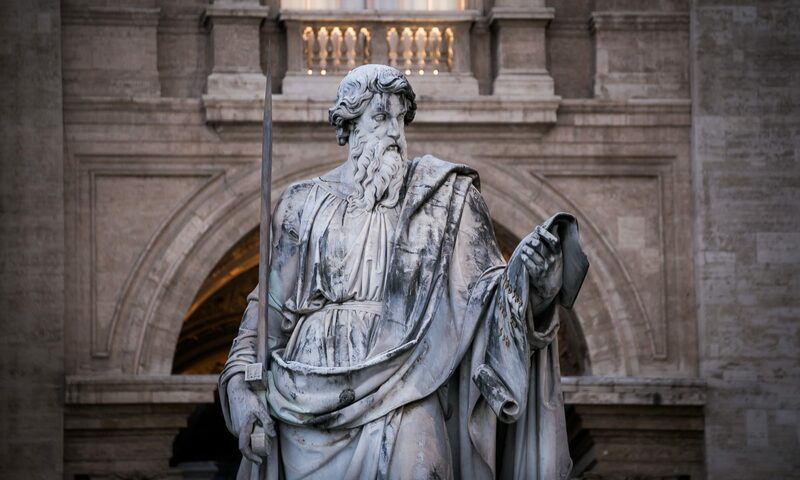 While the book has many merits in laying out the overall picture, it does not fully help Evangelicals to think about Roman theology as a complex, yet coherent system. Contrary to the ambiguous answer given by Noll and Nystrom, the Reformation is as urgent as ever, for both Catholics and Evangelicals. Next PostNext 20. 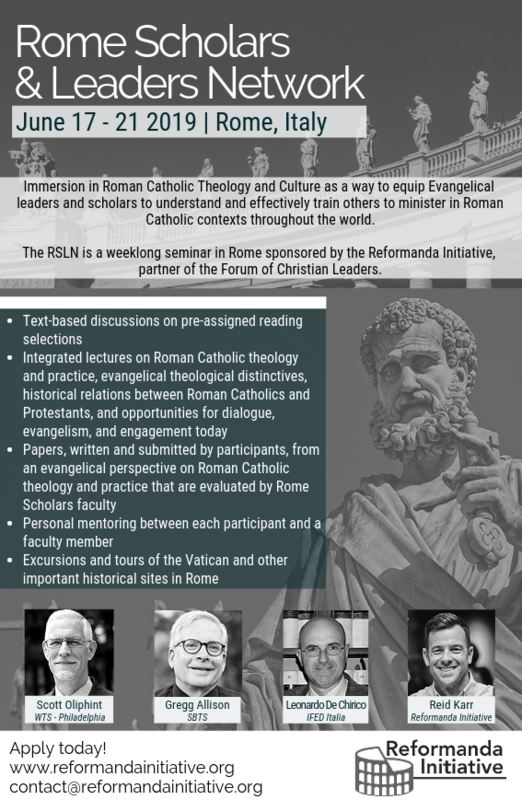 Engaging in dialogue with Roman Catholic theologians.